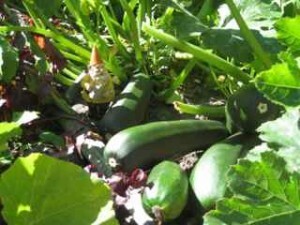 In the Fall, as the nights grow colder and the trees begin to loose their leaves, the gnomes begin their Fall harvest. They must prepare for the long snowy winter ahead while they can with the help of their forest animal friends. Much can be accomplished when done by many helping hands. 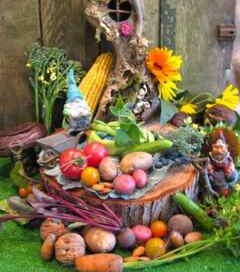 The harvest is now completed and it’s time to celebrate and give thanks to all their fellow gnomes and forest friends. The gnomes call it giving thanks, as we call it Thanksgiving. The main “Giving Thanks” feast consists of many simple foods from the forest and nearby humans’ gardens. The main meal most likely is made up of lots of nuts and dried berries, fruit, beans, peas, carrots, beets, potatoes and anything else they can find at this time of year. Gnomes do not eat meat, but do like milk and cheese. Lots of protein there! 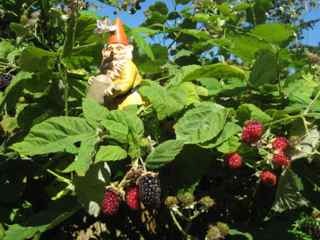 Gnomes also love beer and fermented berry juice. During the big feast, there is, of course, a lot of good story telling and many laughs. 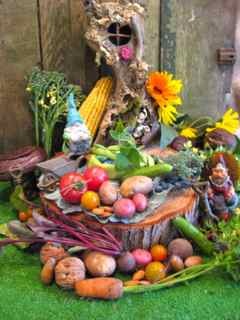 It is a happy time in our Whimsical Woods around Thanksgiving for all of us and our happy gnomes. A little extra bird seed scattered around is my way of saying thank you to all our little helpers. Garden gnomes are reported to be excellent gardeners and caretakers. It is that time now, mid to late Spring, that we all look forward to getting the garden set with this summer’s fresh home-grown vegetables. Aside from forest mushrooms, the gnomes will look to help themselves to what the humans have planted. And they take great joy in catching those slugs. 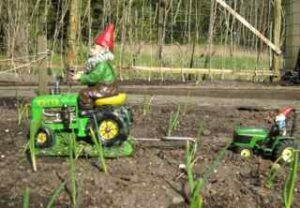 After a long, cold winter, the gnomes are looking for fresh vegetables too. A fun gift from the gardener’s children is to lay out an extra carrot or two, maybe a few fresh greens and other Spring vegetables. Organic is best, but they’ll appreciate almost anything now. 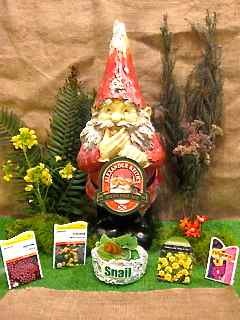 Make friends with your garden gnomes and they will return the gift and watch over your garden all summer. 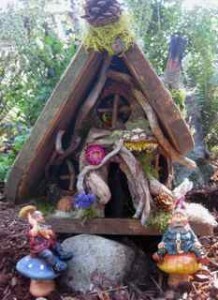 Need a few little gnome garden homes around, just let us know. They’re on our website and we’d love to ship you one, or a few. They will be noticed and greatly appreciated. All is well. Happy Easter to all. Growing up in New York suburb of Yonkers, my parents always planted a large vegetable garden each year. The slugs were plentiful and caused a lot of frustration and damage. Rather than use harmful poisons, my mother would fill a little tin or saucer with fresh beer. My grandfather was the founder and partner in the Yonkers Brewery on Chicken Island, famous for the Yonkers dark stout. The brewery was called Jackson Brewing. Anyway, we always had fresh beer to fill the tins to drown the slugs. Well, I’ve since come to realize that the slugs were not in fact drowning, but the garden gnomes were drinking the beer on a nightly basis and whacking a few slugs to leave in the new empty tins. Humans thought the snails drowned, so out went more beer and back came more dead slugs and snails! the gnomes drank all the beer and gathered up the slugs. The end results were the same – less slugs/snails and a lot of happy gnomes! So, when you go out in the morning and see a tin of slugs, but the beer is gone, the mystery of over. Where did the beer go? A few happy, sleeping gnomes with maybe a little headache, but looking forward to another night’s adventure in your garden. 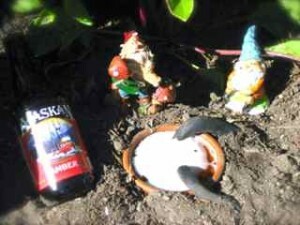 The garden gnomes whacked the slugs and drank the beer! They are very small, but very clever. Happy garden gnomes are the key to a successful garden. All in fun and all is well in the Whimsical Woods. 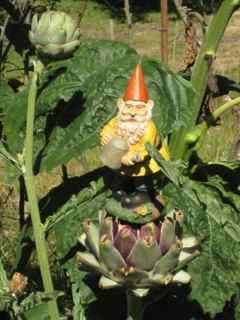 Familiar to garden gnomes are the very popular garden grown artichokes here in the Pacific Northwest. Not only are they good to eat, but once the leaves are dried, they are used in many different ways around the gnome households. They can be used as a canvas on which they paint using forest stains and homemade paints. 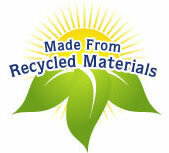 They can also be used as window shutters, light deflectors and even shingles on small wood sheds. The artichoke stalks are taken apart and the very stringy core is used to weave ropes for use around gnome households. What is not used by the gnomes is saved for their deer friends. They seem to enjoy chewing the stringy stalks. Maybe it helps them also. Let a deer get into your garden and you’ll see. Best have a gnome-proof gate latch, if there is such a thing? Very smart, these little people and we love their company here at Whimsical Woods. All in fun and all is well. Several years ago, I wrote about the real truth in catching garden slugs/snails. It is that time of year again that we find those hungry little slugs after our now ripened red strawberries and tender lettuce. The story of how the garden gnomes work this dilemma is worth repeating for our newest readers. It appears the gnomes will gather for a Sat. night meeting and woodland potluck. Lots of fresh produce from our garden, thanks to their help, provides a plentiful setting. Maybe I’ll scatter some good black sunflower seeds about to add to their banquet along with a red strawberry or… two. I know they’ll disappear overnight. Garden Gnomes are very popular and a desired visitor to most any garden. You want them to keep a lookout and assist in your garden’s success. These little helpers can turn a black thumb into a green thumb in one season! 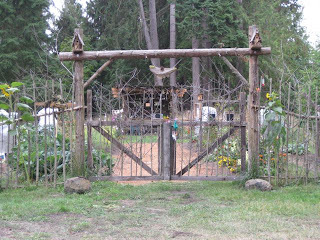 They are fully aware of organic gardening skills and care for various vegetables and flowers. They are know to be very shy and moody as well as very observant of us and nature. We want to keep them happy with fresh water, red strawberries and little snail tins full of fresh beer. Most important, lots of fresh beer! They will deal with the slugs and snails after they brink your beer. And all these years you were taught that snails crawled into the beer and drowned. The Garden gnomes drink the beer and then toss the snail in. Very smart. Venture into your garden at night and listen for a little “belch” or “burp.” Have you ever seen a snail or slug actually crawling into a beer filled tin? But you find them there in the morning. So, there you go. Garden gnomes are very good to have. You’ll need a gnome home, however, for them and you already “gnome” where you can get one of those! The Whimsical Woods Gnome Stories and Blog is back! We also completely revamped our website to bring it up to date with modern day web technology, Thanks to ouir awesom web designer, Jef Gunion. http://guniondesign.com. We have written many gnome stories over the years and they are now included in our new site under the “Blog” heading. 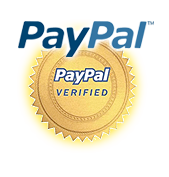 Many have not seen them, but now they are easy to access without ever leaving our website. I thought it would be fun to go back to the beginning of our stories and reprint some of them. That said, we are happy to re-run some of the more popular stories for all to enjoy. So with that, I take you back to our first introduction and continue from there. Enjoy and let’s hear from you! Keep in touch and the spirit of our friendly little gnomes in your heart. It makes all smile. There is news and activity here on our forest floor regarding the pending cooling days ahead. Somehow the ducks and geese flying overhead have alerted the gnomes of a bad winter this year. Gnomes have special means to predict future weather by looking at the foliage and watching the ants. I sometimes see little piles of deer fur here and there which the Gnomes use to make warm boots. We have lots of deer, so no shortage for boots! Likely we’ll see little stacks of seeds and nuts next as they prepare for winter. Here I thought the birds were eating all my food! The Gnomes live well in the forest and with our vegetable garden nearby. I think they are very happy. Last night I left our garden gate open, and there went our beautiful roses! The gnomes had tried to scare the deer away, but gave up and had to resolve to watching and laughing while the deer enjoyed their midnight snack. I expect to find puffs of deer fur now on the gate latch as a little friendly reminder. Their little way of poking fun at me. ha ha – tee hee!